According to the U.S. Department of Health & Human Services, only 1 in 3 children are physically active every day, and the average child spends more than 7.5 hours a day in front of a screen. It is for this reason that recreation centers play a crucial role in our city communities, providing an outlet for those who want get out of the house, be and stay active, and for parents who want to encourage healthy lifestyles for their children. The City of Rochester R-Centers are a promise to Rochester residents to be a positive force in the community that molds and changes lives. R-Centers strive to meet this mission by offering programs, facilities and professional staff to promote healthy living, education, creativity, self-discovery and positive relationships. Rochester’s R-centers offer an abundance of year-round social, cultural and athletic programs such as free summer breakfast and lunch, school-year dinners, a Youth Council, homework help and hundreds of seasonal events. Activities such as basketball, football, kickball, softball, and dodgeball are examples of sports that are offered, and all the R-Centers have a variety of facilities, such as game rooms, gyms, meeting rooms, playgrounds and much more. For many youths, teens and adults, they are popular places to gather, play and socialize. At the end of this past summer, we wrapped up our work at Campbell Street R-Center for the City of Rochester. For this project, it was important to not only understand the issues around maintenance of the aging facility, but it was important to understand the needs of the neighborhood, DRYS and the operating staff. Edge attended neighborhood open houses to present ideas and receive feedback and facilitated multiple user meetings that included staff, youth, and City leadership. Scope of work included the replacement of gymnasium flooring, windows, kitchen remodel and various building systems upgrades and enhancements. 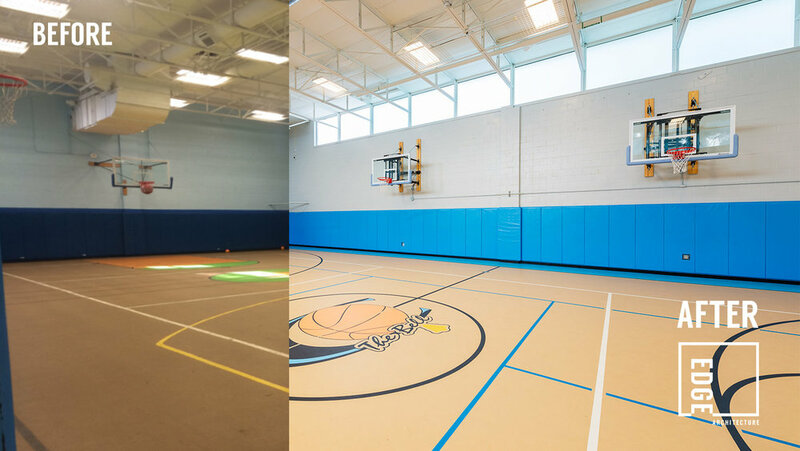 Edge also provided services from Schematic Design through Construction Administration, including RPR services..
Our vision for this project was to give the recreation center a lighter, more visually spacious interior environment. The kitchen was redone using bright pops of orange and blue as accent colors, while stainless steel cabinets were chosen for their durability, cleanability, and add to the sleek and modern finished look. 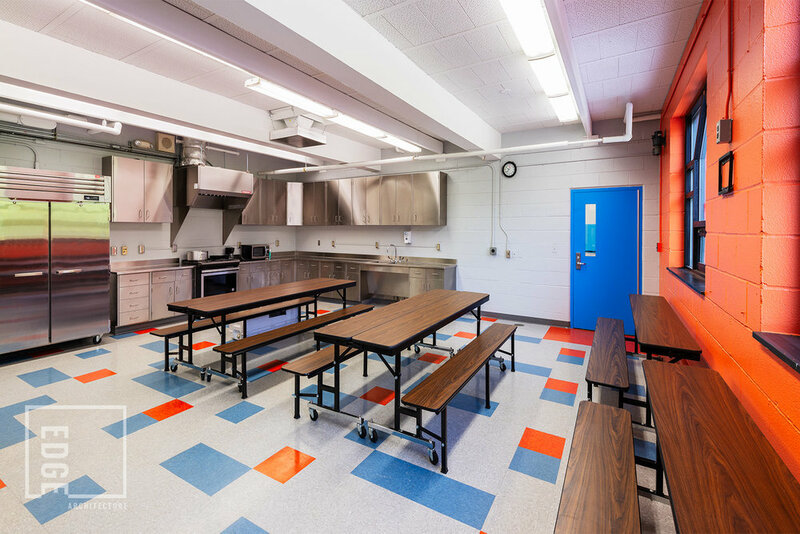 The new kitchen will not only be used for snack/mealtimes, but also nutritional cooking classes to encourage and educate parents and children about the benefits of healthy eating. 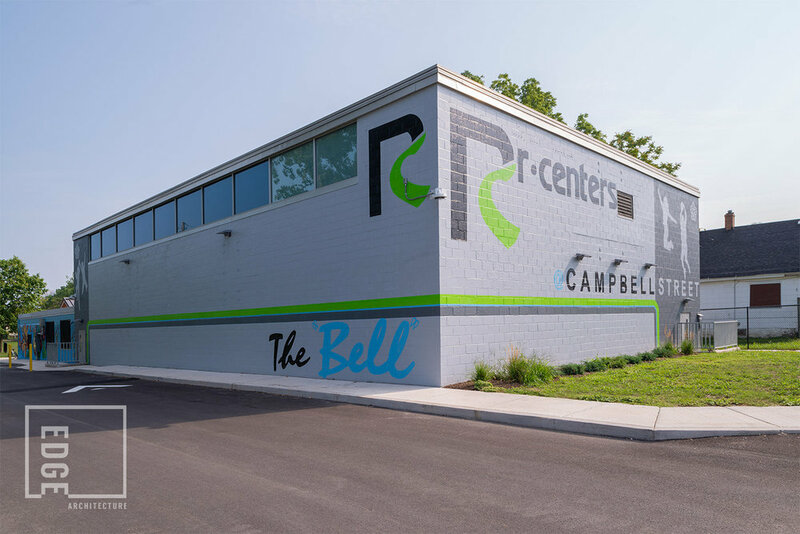 Nicknamed The “Bell”, the recreation center is also a Sports Magnet Site, offering specialized coaching and training for basketball, football, baseball, lacrosse, soccer and handicap accessible sports. “This upgrade secures the future Campbell Street R-Center as a safe place to learn and have fun while making friends and memories,” said Mayor Warren, who was present to help celebrate the center’s reopening. The entire $1.8M renovation will allow the City to expand the services offered at the center to include more educational programming for children and offer services to adults and families.